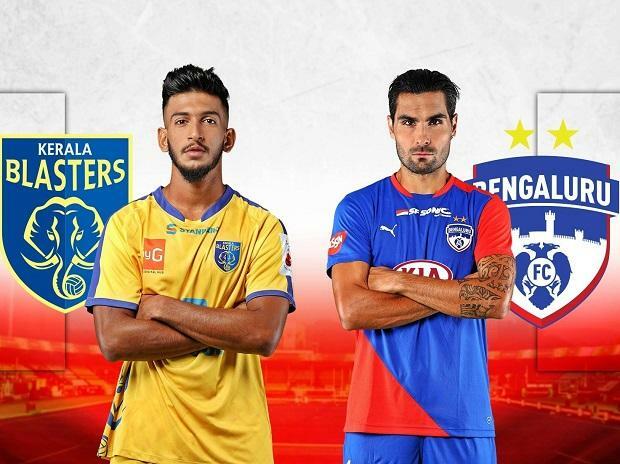 Kerala Blasters will come up against Bengaluru FC in front of their home crowd at the Jawaharlal Nehru Stadium in Bengaluru on Monday in one of the most highly-anticipated matches of the Indian Super League (ISL). The two teams have some of the most passionate fans in the league and their constant banter is what makes this a spicy affair. Last season, when Bengaluru FC came to Kochi on the eve of New Year, they thumped three goals in what was Rene Meulensteen's final game in-charge. This was the biggest home defeat for Kerala last year. On the other hand, Bengaluru FC look in sublime form with Miku firing on all cylinders. In their previous tie in Kolkata, Carles Cuadrat's boys conceded in the opening quarter of the game and were struggling to break the host's defence until Miku produced a moment of brilliance from a set-piece. A lot would depend on how Sandesh Jhingan copes against the Venezuelan striker. SQUAD: The Kerala technical staff have identified their profligacy upfront as one of the important reasons why they are not able to convert draws into wins. Hreiðarsson said Kerala will make changes in order to keep the squad fresh. CK Vineeth will be pumped up ahead of the game as he will come up against his former team. Rino Anto, who switched to Kerala last year, has moved back to Bengaluru FC and will be keen to make a mark as well. MANAGERS SPEAK: "Bengaluru FC are one of the best teams in the league. This will be a make or break game for us," said Kerala Blaster's assistant coach Hermann Hreioarsson. "We go into every game to try and get the three points and tomorrow is no different. We are desperate for a win. We will be out there, trying to achieve that," he added. What's notable about Bengaluru is that apart from their goal scoring exploits, they have been miserly at the back with just three goals conceded. Carles Caudrat hailed his new defensive duo of Albert and Nishu for their work. "It was no easy task to replace John Johnson and Subashish Bose. But, I'm very happy with the way Albert and Nishu (Kumar) have come in and done their job. I am really happy with the intensity they have shown going forward," said Cuadrat ahead of the clash. FORM: Kerala have managed to remain undefeated this season but have won only one of their five matches so far. David James' men have looked good going forward, scoring in their every match. The forward players Matej Poplatnik, Slavisla Stojanovic, Halicharan Narzary and CK Vineeth all have registered their names on the scoresheet while Seiminlen Doungel has three assists to his name. Despite this, for a team that's creating many chances, Kerala have faltered in converting those chances to goals. As for Kerala's defence, apart from the opening match when they shut out ATK, they have failed to register a single clean sheet since then. Another cause of concern for David James must be their form at home where the Blasters have managed to win only two out of last 11 matches. This season so far, Kerala have scored seven goals from 26 shots on target. They have the passing accuracy of 70.42 per cent and have kept clean sheet once. Under Carles Cuadrat, Bengaluru have hit the ground running this ISL season and have three wins and a draw in their opening four matches. Their famed attacking duo of Sunil Chhetri and Miku have both scored three goals each already. Miku, particularly, has been in an ominous form while on road. Bengaluru will also be a big threat from set pieces. Almost 50 per cent of their 41 shots on goal so far have come from set-pieces or have resulted from one. Both of their goals in their last match against ATK came about from free-kicks. As for the defence, Bengaluru's back four has managed two clean sheets in their four outings so far. The Sunil Chhetri-led unit has scored eight goals from 17 shots on target. They have the passing accuracy of 67.05 per cent while having two clean sheets.